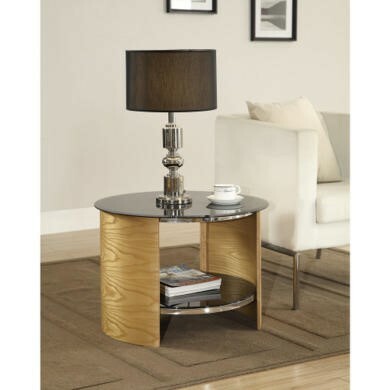 The Curve round lamp table is a beautiful mix of materials combined in one curvatious design, giving it a modern and unique style. The sleek black glass contrasts with the light oak to create a strong and stylish impact, touches of chrome trim accentuate the contemporary look. The Curve round table has a strong metal frame. The side are real oak veneer giving you the light and neutral finish. The top and under shelf are toughened black safety glass.